Relax and start enjoying your vacation in our new 1500 square ft luxury two Bedroom and two Bathroom sub-penthouse condo with stunning ocean views in a quiet beach community. 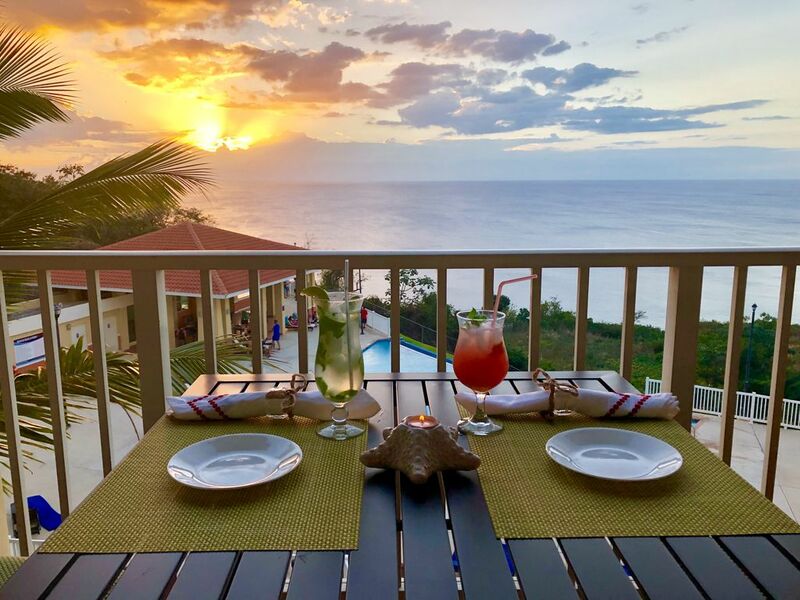 This comfortable and elegant vacation rental is located on a cliff 300ft above pristine oceanfront and it recently was awarded Best Resort-Type Living Community in Puerto Rico for 2008. One of the many features that make this condo truly unique is its incredible ocean view and breathtaking sunsets you can enjoy from our spacious balcony. The view at the left was taken from our balcony. Spend the day at Crashboat Beach soaking up the tropical sun and cool off in the turquoise waters. This is a popular scuba and snorkel dive spot. Our condo offers recreation and relaxation at one location. Whether you want to stay by the infinity pool in the morning, lie at the beach in the afternoon, sit on the deck at sunset; or, golf, surf, snorkel, scuba dive - it's all right at your doorstep. Beautifully decorated and immaculate, the condo provides you and your guests with hours of comfort and relaxation while on vacation. Furnished in a wonderful modern tropical setting, it is fully air-conditioned and comfortably sleeps six (6) people. Our condo offers a spacious living area and fine dining room. The family room has a queen sofa bed, a 37' LCD TV, DVD/cable, Ipod docking station, wireless internet. It has a fully equipped gourmet kitchen with stainless steel appliances and a large private terrace. Our spacious Master Suite features a queen size bed, desk, walk-in closet, private modern bath and separate dressing area with vanity. Comfortable second bedroom has twin beds and mirrored closet doors. To make your stay more enjoyable we have a washer/dryer inside unit, hair dryers, baby crib, large/small cooler, beach chairs, and beach towels. Linens and towels also provided. After a long day at the beach or sightseeing just enjoy the well appointed amenities our condo has to offer. Puerta del Mar has three pools, one infinity pool with spa, second adult pool and a children’s pool and playground; outdoor bathrooms and showers, well maintained landscaped grounds; canopy/spa beds for outdoor relaxing; two assigned parking spaces with remote controlled gated entry, outside BBQ grill, gazebo/sundeck with viewing plaza overlooking the ocean with majestic sunsets. A casino at nearby Marriott Hotel, scuba, snorkel, surf, and bicycle rentals, a fitness center, basketball and tennis courts, bowling, movie theatres, shopping malls, a water park, a skateboard park, wind surfing, horseback riding, jet skiing, and even an ice skating rink are all nearby. Coast Guard Military Exchange is less than 10 minutes away. Many other attractions are within an hours drive. Avoid the rush and crush of San Juan Int. Airport and fly Jet Blue, Continental, Delta into Aguadilla Airport (BQN) just 10 minutes away; go from plane to pool in less than an hour. Come visit this beach paradise where no US passport is needed and US currency is used. Our fully furnished condo is like staying at a five-star resort and is far superior to staying in a hotel. Additional pictures visit our Homeaway ad. Until confirmed, all rates subject to change. Please call Robert at one of the numbers below. Roku with diverse offering including HBO GO, Showtime, NICK, Disney, ESPN, Netflix, and multiple live channels. DVDs targeted to small children. Bistro set and loveseat glider. Spacious seating for 8 people. Children's Playground, Spa-Beds, Outdoor Shower and Bathrooms at pools, Expresso/Cappuccino Machine, Blender, Coffee Maker,Tea Kettle,Foreman Grill, toaster, alarm clocks, hair dryer, beach chairs, cooler, beach towels, iron & ironing board and ceiling fans. When you rent a place you need to be able to flush toilets and take showers when you desire. Luxurious is not quite a true definition based on us standards. We were there for 9 nights and no water for 5 of them. They are water rationing. To flush the toilets we had to either steal water from the pool or stock up water in buckets from a day we did have water. This was absolutely known by the owner and should have been told to us and we would not have stayed. Going to the beach? Better do it on a day you have water if you want a shower. We had 5 people using the toilets and 26 hours every other day without water was a nightmare. We apologize to this renter for his inconvenience and his not enjoying his stay. This problem is area wide and not within our control. We were not aware of the problem when the reservation was made. In addition, we believed that the outages were periodic during the day and not day long until our guest informed us of the situation. We will offer this guest a steeply discounted rental if he decided he would like to rent from us in the future when the water situation is resolved. Absolutely Perfect!!! Clean, beautiful, relaxing!! We never needed anything. If you want a perfect, clean place to stay in Puerto Rico this is the place. The owners are wonderful people that were very helpful with every detail. Our family stayed in this perfect condo and perfect location for a week. It was exactly what we expected and couldn't be happier. We had no problems with the unit and Mr. Diamond was very responsive throughout booking. The condo had everything we needed. We were especially happy to have beach chairs and coolers available for our days at the beautiful Crash Boat beach. The location of this property is perfect for exploring other beaches as well, Shacks Beach, Jobos Beach. We will definitely come again. PERFECT VACATION - this condo is awesome! 2nd time around....First stay was great, second stay even better. This unit is FANTASTIC. Beautiful, great views, great space, all the amenities you will need for a perfect vacation (it even has a "caldero" for me to cook - double win). Owner is fantastic to work with. Hanging out on the balcony or poolside and watching the sun set is truly amazing. can't get any better. Thanks again Bob for opening your home to us. Great locations, Amazing views of the Aguadilla Bahia , CrashBoat Beach! Amazing infinity pool. Accommodations/Condo was clean and had all amenities needed to host my family (wife and three kids). It had an amazing oversized balcony with the spectacular views of crashboat beach. The condo is within two minute drive to the the beach and easy access to the infinity pool. Very peaceful community. We want to thank Bob Diamond for his hospitality and for giving us an affordable rate for me and my family to be able to stay in his beautiful condo. Thanks Bob! We rented the condo for a week in February with another couple. The layout is very good for two couples since we took advantage of the option to have the twin beds made into a King with the converter kit that is offered. The condo was immaculately clean, well laid out, and stocked with chairs, coolers, towels and other essentials. It had beautiful sunset views which we enjoyed from the terrace. The development as a whole was well maintained and felt secure with the gated entrance. We went down to Rincon for a day, but felt the beach was better at Crash boat and it was nice that it was only 2 minutes away. We took a standup paddleboard excursion with Verde Azul eco tours and this was an amazing experience. We took advantage of the aerobics class that is offered daily in the nearby park and met some really nice local people. The area seems to be a mix of retirees, many from the United States, along with the local residents. The nearby restaurants that we particularly enjoyed were Boca Loca and The Eclipse. We would certainly recommend this condo and area for a laid back vacation. Gambling/casino,whale watching,bowling,skateboard park,banana boat rides, ice skating and water park.